Do you or your dog need a quick mental boost? Then spend some time outside doing activities together. You’ll both benefit from being active outside, feeling healthy, and interacting with other people. You don’t need to live in the countryside to feel active outside and do healthy exercises together. City dwellers and their pooches have many options available to them. Many cities have dog parks which allow dogs to either roam free or ramble around on-leash. With many interesting smells to explore, your pet will love to walk, run, or play in the park with you. Off-leash parks are perfect for playing ball or Frisbee. Before you buy a disk, though, make sure your dog is fit enough to play Frisbee. Since it involves a lot of jumping, this activity may not be ideal for older dogs. Should you opt for running or playing Frisbee, always increase the exercise level gradually for newly active dogs. There are many sights to see in the city, whether you choose the concrete or green areas, and what better way to enjoy it than with man’s best friend. Grab a local map and mark off a path you’ve never traveled before. Go on a fun adventure with your dog! Many cities have hiking trails or wooded areas that allow four-legged hikers. Connect with your pup and nature at the same time, soaking in the beautiful views, fresh air, and lush green beauty. Hiking with your dog is like food for the soul. If you live in a city next to the ocean or a lake, make sure you find out whether there are any doggie beaches nearby. Some beaches will camp off a specific area for dog lovers and their pets to play, either on- or off-leash. On warm days, swimming is an ideal pastime. Swimming is a fun and low-impact exercise – perfect for dogs with arthritis or recovering from injuries. Make sure you pack sunscreen, for yourself, and a life jacket for your dog, and stay hydrated. Not all dogs like swimming. Don’t force your dog to swim and always go into the water with him. It’s more fun swimming together. 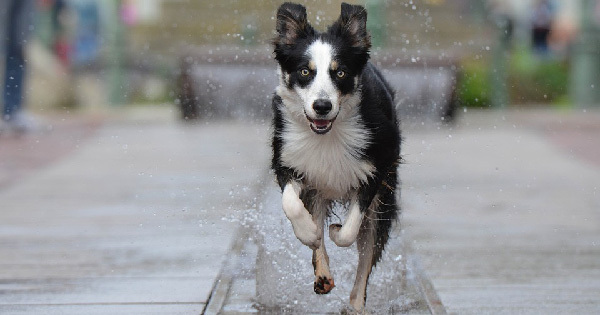 If your dog is fit enough, you can teach him or her to run alongside you or your bike. There are special leash hooks available that can be attached to the bicycle frame, allowing your pup to keep close without the leash getting entangled in the spokes or pedals. Running on a treadmill. Go at a slow pace at first to help your dog get familiar with the strange machine. Before long, he’ll love to run with you. Indoor games, such as playing hide and seek, can keep your furry friend busy and active for a while. Running up your building’s stairway is a great way to stay in shape. First, start at a slow pace and increase your speed over time. Don’t run down the stairs as it can be heavy on the knees and easy for dogs to slip and fall. Make sure you know how to control your dog. If he gets into a fight, will you be able to break up the fight with your voice commands? If not, make sure you and your dog go for training to learn the essential skills. Always clean up after your dog. There’s nothing worse than stepping into poo unsuspectingly when walking in the park. Make sure you always have a leash handy, even if you’re at a park that allows free roaming. You never know when you might need it. Keep you and your dog hydrated and remember that you may need to drink more water than usual on hot days and when you’re active. Research the dog-friendly area before you visit and make sure you understand the rules of the urban area. Always follow the regulations – that way we can keep dog-friendly areas open. Who said being healthy and active can’t be fun? Scout out your local dog-friendly areas so you and your pet can get some fun, active time together. Payal Bhandari M.D. is a holistic family physician at her practice, Advanced Health. She provides personalized, comprehensive primary care to families and individuals of all ages in San Francisco since 2005. Her integrative style blends the best in western and eastern medicine to effectively transform health.